The proportion of adults aged 25 to 64 who had completed high school was higher in Canada than in all but four of the reporting members of the Organisation for Economic Co-operation and Development (OECD). In 2014, 90% of Canadians aged 25 to 64 had completed at least high school, well above the OECD average of 76%. Conversely, the Czech Republic (93%), Estonia (91%), the Slovak Republic (91%) and Poland (91%) posted higher proportions. The United States matched Canada at 90%. The proportion of 25- to 64-year-old Canadians that had completed at least high school was also higher than the OECD average in all jurisdictions except Nunavut (51%). Proportions ranged from 82% in the Northwest Territories to 93% in British Columbia. In 2014, almost two-thirds (65%) of Canadians aged 25 to 64 had completed postsecondary education compared with the OECD average of 41%. The proportion of individuals who had a university degree (bachelor's, master's, doctoral or equivalent degree) was 28%. Canada placed around the middle for this measure of educational attainment, ranking 16th out of 34 OECD countries. 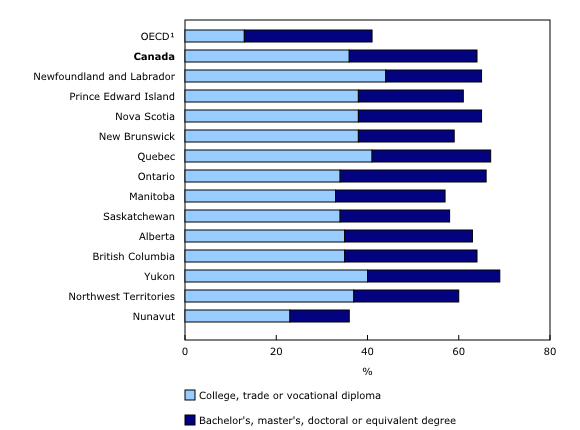 Those obtaining a diploma in other types of postsecondary education, including at the college, trade or vocational level, comprised 37% of Canadians aged 25 to 64. This partly reflects Canada's extensive network of colleges, a system not seen in most other OECD countries, where the comparable average was 13%. Higher levels of education are generally linked to improved employment prospects. In 2014, the employment rate for adults aged 25 to 64 who had not completed high school was 56% in Canada, identical to the OECD average. By comparison, the employment rate among individuals of the same age group was highest for those who had a college or university credential at 82%, close to the OECD average of 83%. The resources devoted to education vary across the OECD, as measured by the share of gross domestic product (GDP). In 2011, Canada spent 6.4% of GDP on education compared with the OECD average of 5.3%. The share of GDP devoted to educational institutions varied across Canada, ranging from 5.2% in Alberta (which had a relatively high GDP compared with other jurisdictions) to 9.8% in Nunavut. Current expenditure is a measure that reflects spending on school resources that are used each year for the operation of schools and excludes capital spending. Staff compensation was the largest single expense, accounting for 78.7% of current expenditure at the primary and secondary levels in Canada in 2012, a proportion similar to the OECD average. At the postsecondary level, staff compensation accounted for 66.5% of current expenditure, with the short-cycle tertiary (college) level (67.3%) posting a slightly higher proportion than the bachelor's, master's, doctoral or equivalent (university) level (66.1%). In 2012/2013, teachers reached the top or near the top of pay scales after 10 years of experience in all jurisdictions but Quebec, typically making around one-and-a-half times their starting salaries. In Quebec, teachers reached the top of the pay scale after 15 years of experience. By comparison, the OECD average for the length of time it takes to reach the top of the pay scale was 24 years. Teachers in Canada spend more time teaching, on average, than their OECD counterparts. For example, Canada's primary teachers averaged 795 hours per year in 2012/2013, compared with an average of 772 for OECD countries overall. Differences were also seen at the lower secondary level (generally Grades 7 to 9), with 742 hours per year on average in Canada compared with the OECD average of 694 hours. At the upper secondary level (generally Grades 10 to 12), Canadian teachers taught an average of 743 hours, compared with 643 hours on average for the OECD. 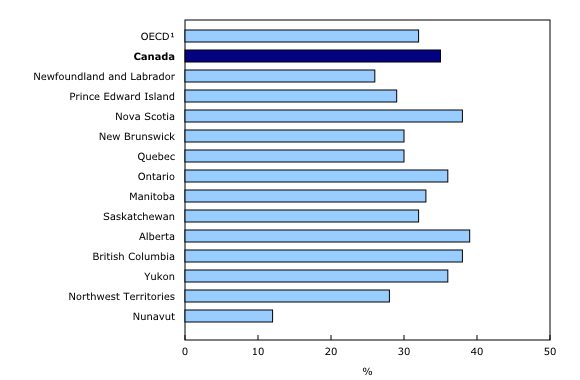 Canada compared favourably with the OECD average in terms of computer literacy. In a 2012 computer-based assessment of skills and readiness to use information and communication technologies (ICT) for problem-solving in technology-rich environments, Canada had a slightly higher proportion of adults aged 25 to 64 who had good ICT and problem-solving skills (35%) than the OECD average (32%). There was considerable variation among the provinces and territories, with Alberta, British Columbia, Ontario and Nova Scotia being above the OECD average, and Nunavut and Newfoundland and Labrador being below. A higher level of educational attainment among Canadians was associated with a higher level of ICT problem-solving skills. For example, 5% of Canadians who did not have a high school diploma had good ICT and problem-solving skills compared with 47% of college- or university-educated Canadians. In 2012, younger Canadians (aged 25 to 34) tested at higher levels of ICT and problem-solving skills than older ones (aged 55 to 64), but older Canadians fared better than their OECD counterparts (17% with good ICT and problem-solving skills in Canada compared with an average of 12% for the OECD). As well, a higher proportion of Canadian women (34%) showed good ICT and problem-solving skills than their OECD counterparts (an average of 29%). The publication Education Indicators in Canada: An International Perspective, 2015, is the seventh in a series of reports designed to complement the Organisation for Economic Co-operation and Development's (OECD) annual report on education indicators, Education at a Glance: OECD Indicators. The 12 indicators presented in this 2015 Canadian compendium represent a selection of indicators that were developed to align with the definitions and methodologies used by the OECD in its most recent report, Education at a Glance 2015: OECD Indicators. Data for Canada, the provinces and territories were drawn from several sources and various reference years, as required to provide comparisons with OECD figures. The 2015 indicators for Canada, the provinces and territories capture information on educational attainment, graduation and completion rates at the secondary level, labour market outcomes, expenditures per student, expenditures on education, international students, transitions to the labour market, and the learning environment and organization of schools. It also features an indicator that presents a selection of topics related to a 2012 assessment of adult literacy and numeracy, released in Programme for the International Assessment of Adult Competencies (Catalogue number89-555-X). The information contained in the report was prepared by the Canadian Education Statistics Council, a partnership between Statistics Canada and the Council of Ministers of Education, Canada. The report is part of the Pan-Canadian Education Indicators Program of Statistics Canada. Data for the OECD member countries are from the OECD publication Education at a Glance 2015: OECD Indicators, available on the OECD website.